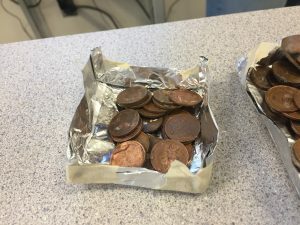 In this experiment we needed to make a boat out of tin foil and marshmallows to hold as many pennies as we could so we folded foil around marshmallows to make a boat, we then put pennies in the boat to see which boat cold hold the most without sinking, our boat held 23 pennies. if we put pennies in a boat then it will float this shows that the boat has the ability to hold the mass of the pennies. In conclusion our boat was only able to hold 23 pennies because it wasn’t able to withstand any more pennies cause of the fact are boat didn’t have enough surface area to spread out the weight of the pennies.